I am on the fence between a two and a three star rating for this one. 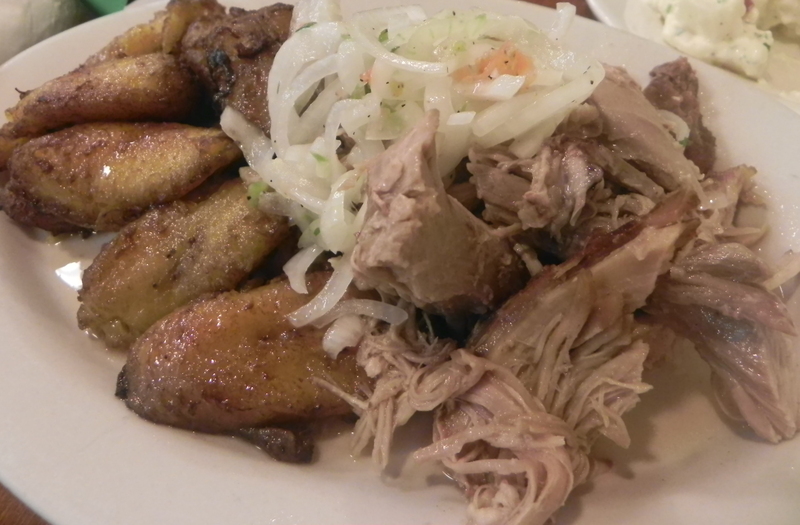 I ordered the pork with spanish potato salad and the sweet plantains. I felt like the pork was really really dry in that it was so hard to chew and my dish was the only one out of four other dishes that were cold. Perhaps, not many people order the roast pork — BUT still not a good reason to serve close to cold dishes. The waitress was nice enough to be patient with my party as we took a while to choose what to eat. Service was fast and had a lot of food on our table in what felt like seconds. 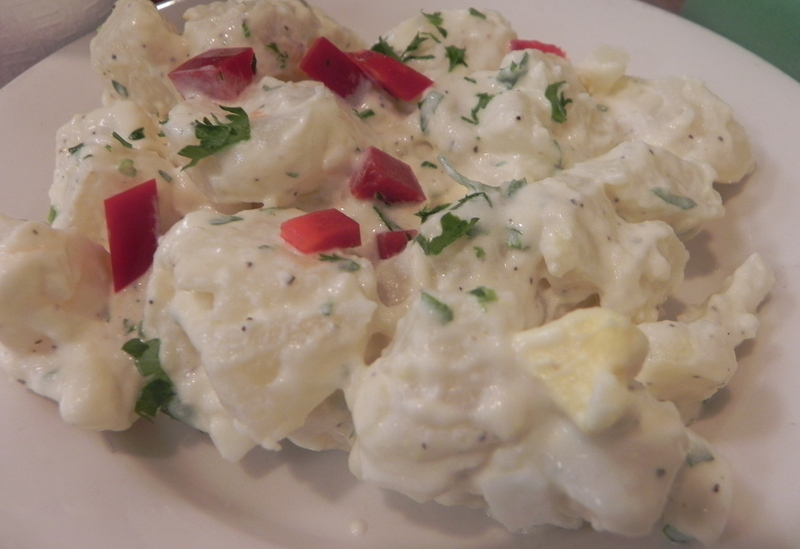 Potato salad was interesting as it had a very strong lemon juice flavor…but other than that it tasted regular. The plantains was really really sweet and reminded me of dessert and I’m the kind of person who doesn’t eat dessert before meals lol. My taste buds were really confused! I DID order sweet plantains but I didn’t realize it would be that sugary…Tasted more like just regular bananas. Compared to Sophie’s (yes, I have to mention this!) it was a bit disappointing. The green sauce was not as good in that it was a lot more watery and less flavored. I didn’t use much of it because of that fact. The place itself is very similar though. Decor is simple though it was not as crowded as Sophie’s. I was a bit disappointed in that we invited Mary and Andy to this place first since we always have home-run restaurants that we go visit haha. But, you win some you lose some. I may have set my standards a little high because I was comparing this establishment with Sophie’s (we reviewed this earlier in the year). It also looks very similar to Sophie’s too! However, I just don’t think the quality of food is the same. First off, this place is relatively busy. It appears that they have a lot of the customers and such. It’s good place to grab a quick bite if you’re on the go, though. The waitress was kind, but didn’t come back to us after we got our food. I ordered tamales and rice with chicken. I wasn’t really sure what to expect from the tamales honestly. It’s a corn meal patty stuffed with ground pork garnished with onions. I didn’t find this appetizer very appealing (but that’s just me). It was moist and sorta tasted like corn bread. Didn’t really taste the pork though. It was however, very moist and soft. The main entrée, the rice with chicken, was pretty average in my opinion. I decided to get the sweet plantains as my side. The chicken was juicy and moist. It looked seasoned, but I couldn’t really taste it. Just your average chicken. The rice was sorta clumpy. The quality of rice is sorta like from a bad Chinese food restaurant. 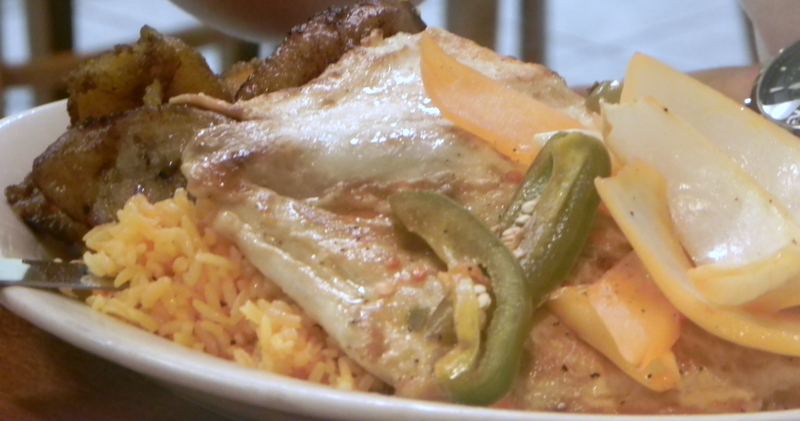 I really loved the sweet plantains though! Sadly, they gave such a small portion as a side. What very positive thing about this restaurant is that it serves its food incredibly quick. It’s probably because that they have most of it ready from the take-out section, regardless, you get your food relatively quick. It’s possible that we may have also come on an “off day” and things weren’t exactly their best. I guess I was expecting more “authenticness” but the mustard in my sandwich seemed like regular mustard. 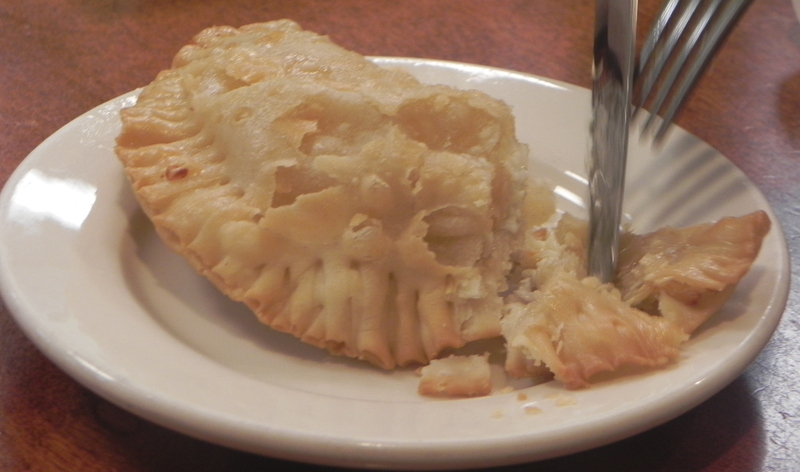 It [Empanada] was okay. I didn’t know that the cheese empanadas was just cheese. I thought it was beef and cheese…I should have got meat in it. But Andy liked the crust. Andy…a man of few words. 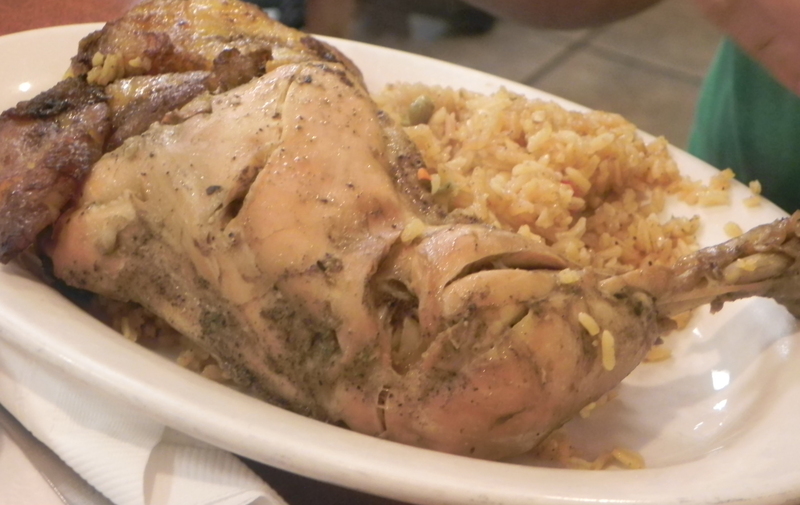 Posted on June 12, 2013 June 12, 2013 by pinkytwinkieeePosted in manhattan, New YorkTagged cuban, cuban cuisine, food, good for lunch, lunch, manhattan, New York, pernil, places to eat, potato salad, restaurant, rice, roast pork. Previous Previous post: Are you on Facebook?